Orthodontics is the specialty of dentistry that focuses on the diagnosis, prevention, and treatment of dental and facial irregularities like crowding, improper bites, cross-bites, over-bites, or abnormal jaw growth. An orthodontist is a specialist who has completed an advanced education residency program following dental school to learn the special skills required to manage tooth movement and guide facial development. Orthodontic treatment can be started at any age. Many orthodontic problems are easier to correct if detected at an early age before jaw growth has slowed or stopped. Early treatment may allow a patient to avoid surgery or more serious complications. The American Association of Orthodontists recommends every child first visit an orthodontist by age seven, or earlier if a problem is detected by the parents, the family dentist, or the child's physician. Phase I, or early interceptive treatment, is limited orthodontic treatment (i.e. expander or partial braces) before all of the permanent teeth have erupted. Such treatment can occur between the ages of six and ten. This treatment is sometimes recommended to make more space for developing teeth, or to correct cross-bites, overbites, underbites, or harmful oral habits. 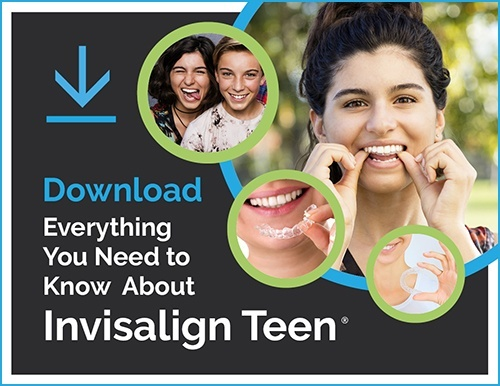 Phase II treatment is also called comprehensive treatment because it involves full braces or Invisalign when all of the permanent teeth have erupted, usually between the ages of eleven and thirteen. Braces use steady, gentle pressure to gradually move teeth. The brackets placed on your teeth and the archwire connecting them are the main components. When the archwire is placed into the brackets, it tries to return to its original shape. As it does so, it applies pressure to move your teeth to their new, more ideal positions. Treatment times vary on a case-by-case basis, but the average time is one to two years. Actual treatment time can be affected by the patient's rate of growth and severity of the correction necessary. Treatment length is also dependent upon patient compliance. Maintaining good oral hygiene and keeping regular appointments are important in keeping treatment time on schedule. New techniques and materials today have made orthodontic treatment more comfortable than ever. The placement of bands and brackets on your teeth does not hurt. Once your braces are placed and connected with the archwires, your teeth may be sore for a few days and your lips and cheeks may need a week or two to get used to the braces. Discomfort, if any, can be managed using over-the-counter analgesics. No. It is strongly recommended, however, that patients protect their smiles by wearing a mouthguard when participating in any sporting activity. Mouthguards are inexpensive, comfortable, and come in a variety of colors and patterns. Will braces interfere with playing an instrument? No, but there may be an initial period of adjustment. In addition, brace covers can be provided to prevent discomfort. Should I see my dentist while I have braces? Yes, you should continue to see your dentist every six months for cleanings and dental checkups. Your appointments will be scheduled about every 6-8 weeks depending on your treatment. The cost of orthodontic treatment depends on many factors, including the severity and complexity of the problem and the length of treatment. We will be glad to discuss fees with you at your initial consultation before treatment begins. Many patients find orthodontic treatment is more affordable today than ever. We offer a variety of convenient payment plans and accept orthodontic benefits from most dental insurance providers. You can also set aside pre-tax dollars in a flexible spending account or other health savings account to pay for your orthodontic treatment.